several activities for young guests, a dining experience that ranges from traditional to gourmet cuisine and houses one of the most advanced the Spa in Europe. Finally, a special mention must be dedicated to the beauty of its rooms, the high level of comfort of the whole resort and a service that exceeds the concept of high quality. The Verdura Resort, 40 km from Agrigento, is situated on the valley of the river Verdura on an area of 230 hectares, between olive and lemon trees. It is a luxury oasis immersed in the peace of the Sicilian countryside; the area is not well known yet by mass tourism and this is the feature that gives to this resort more exclusiveness. The international airport Falcone- Borsellino is about 120 km far from the hotel. The Verdura Resort is the successfully result by the architect Flavio Albanese who creates a deep Mediterranean atmosphere with original contemporary nuances. Materials like stone, sand and wood of the hotel’s exteriors are in harmony with the hand painted majolica, with the colour of the ground that recapture the ancient Sicilian villas style and also with the design lamps and the modern dark wooden poster beds. The concern towards ecology has taken the hotel to implant photovoltaic systems as well as rain water recycling systems used for golf fields irrigation. 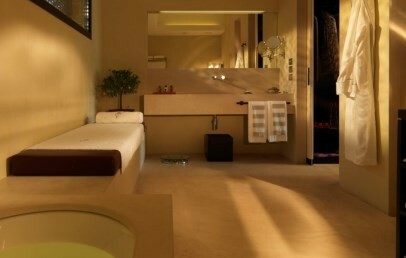 The 203 rooms of Verdura Resort are large and bright and guarantees privacy and all modern comforts. They offers an elegant atmosphere due to a sober and refine style. Located in two different building typologies, with garden or panoramic, all rooms provides four-poster bed, polished concrete floors, Made in Italy lamps and craftsmanship pieces and en-suite bathrooms with stone tops. 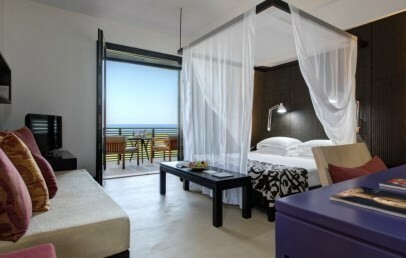 Deluxe – 40 sq.m., king-size bed, balcony with sea view. 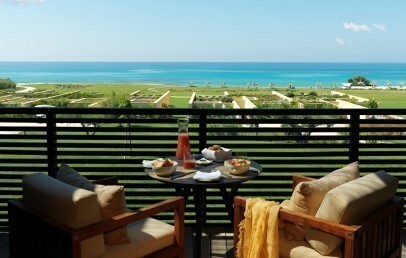 Superior Deluxe – 40 sq.m., panoramic position, king-size bed, terrace with sea view. 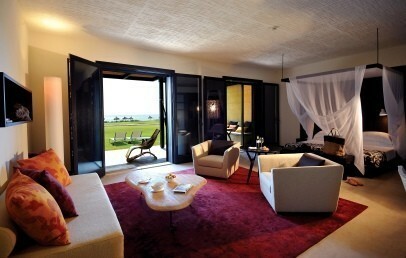 Superior Deluxe Seafront Room – 40 sq.m., on the ground floor, living area, terrace with sea view. 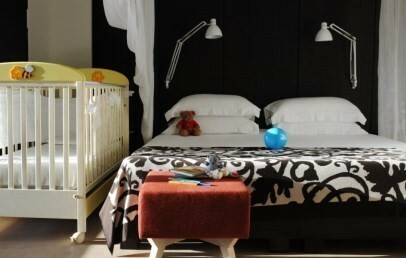 Junior Suite – 60 sq.m., king-size bed, balcony with sea view. 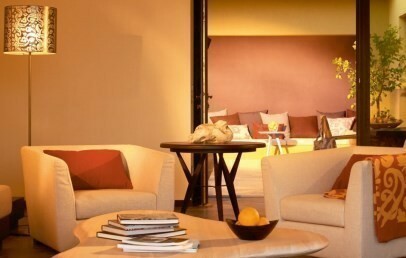 Classic Suite – 60 sq.m., king-size bed, panoramic position, terrace with sea view. 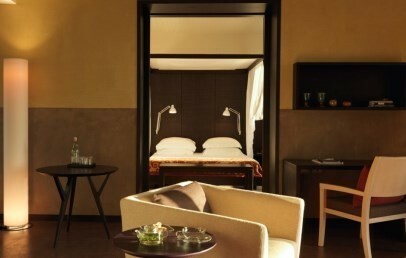 Grand Suite – approx. 72 sq.m., ideal for a family with 2 adults and 2 children from 0-18 years, it offers a large living room, a kitchenette, a master bedroom and an equipped terrace. 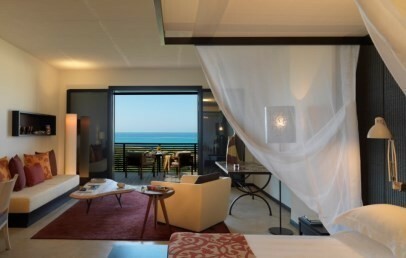 The sea side location is an additional relevant peculiarity of Verdura Resort. From your room, you can easily reach 1,8 km of fine sand and all comforts and facilities to enjoy the beach: sunbeds, umbrellas, bar and water sports. 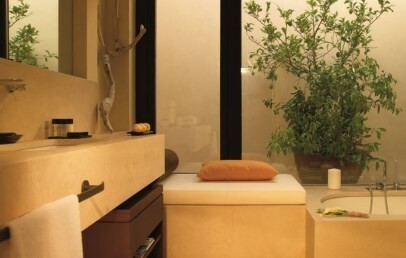 Located in the heart of the Resort and surrounded by olive groves and gardens, the Spa of Verdura Resort is at the leading edge in Europe. It covers an area of 4000 sq.m. and consists of 4 buildings which house treatment rooms (including double treatment suites), a 20 m indoor swimming pool, four outdoor thalassotherapy pools (from 25° and 37° centigrade and with different salt densities, minerals and organisms), hammam, saunas, gym, fitness room, hair and beauty centre. The Spa presents also a welcoming bar with a golf courts view terrace which offers light meals, fruit and vegetable juices, infusions and healing teas. The qualified personnel will prepare for each guest a tailor made program with fitness, wellness treatments, thalassic therapy and yoga classes. 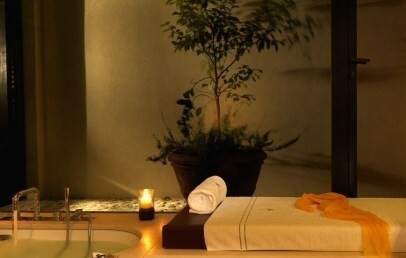 SPA access is unlimited and complimentary for guests (to pay are massages and all treatments). Please note: from May 1st to October 31th children under the age of 15 y. are not welcome to the Spa facilities including the indoor pool. The key point of the Resort is doubtless the Golf Course of 120 hectares, with one 18 holes and one 9 holes courses, designed by the Californian Architect Kyle Phillips. The Verdura Resort Golf Club has been projected with the philosophy to fully blend in the natural environment that surrounds the golf courses and underlines the beauty and identity. Besides the golf, the guests can enjoy jogging routes, 6 tennis courts, football field, sea sports, a fully equipped fitness centre and an infinity swimming pool (60 m). To take advantage of the various packages of Golf-Hotel, please contact us for more information. Verdura Resort is an exceptional family friendly hotel thanks to the several facilities dedicated to young guest. It is possible reserve communicating rooms and add a cot or add a 3rd bed in some typologies room. 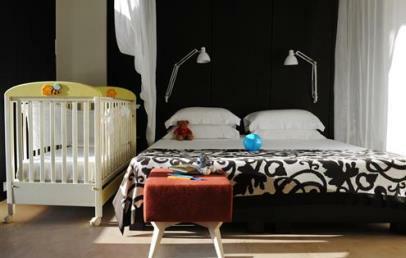 At disposal high chairs, sterilizers, baby bottle warmer and baby-sitting professional service. Special kid's menus are available at the restaurants and a safe and secure environment is guaranteed at the swimming pool and private beach area. The Verdura Resort has the Verduland & Youngclub where the youngest can have fun and entertainment. The Kids Club is dedicated all the children from the age of 4 to 12, consists of a playroom with movies and cartoons and areas dedicated to special activities (pottery classes, cooking lessons, acting and theatre). The outdoor area has a small pool, a sand pit, swings, a see-saw and football goals. On request, group tennis, water sports, golf and swimming sessions. The Teens Club is for al young guests from the age of 13 to 18 and provides a billiards table, darts table, board Games, Nintendo Wii and tailor-made programs based on sports and activities as football, tennis, golf and waters as well as excursions, cooking, alcohol- free cocktail-making and pottery classes. Disco, cinema and karaoke nights are usually plan to enjoy the evenings! The Verduland & Youngclub are open daily from 10 am to 6 pm and are complimentary (opening and closure may vary depending on the season). 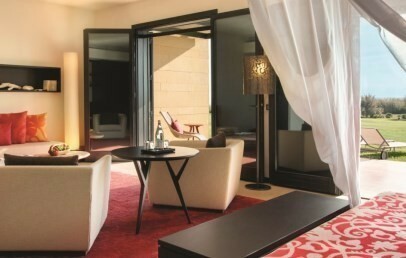 Verdura Resort is also an ideal accommodation if you are looking for a “gourmet stay”. Guest can choose among four different restaurants successfully managed by the Michelin Chef Fulvio Pierangelini who culinary philosophy is based on local products, traditional recipes and cooking methods. The refined restaurant "La Zagara" proposes a Mediterranean cuisine with deep Sicilian influence. The restaurant "Liola" is recommended for an informal dinner: it is a regional eating house able to surprise all the guests with the Sicilian traditional dishes. Buffet breakfast is served at the "Buongiorno" restaurant while, if you love barbecue fish and shellfish, there is "Amare Restaurant", located on the beach. All Restaurants have an extensive wine cellar and provide many regional wines from around Italy and the world. Verdura Resort houses 5 nars too and each one features relaxing and stylish environment: Pool Bar, Granita Bar, Torre Bar, Beach Bar and SPA Bar. The Verdura Resort cooking lessons are an invitation to know more about the secrets of this particular and prismatic land. There are ten meeting rooms with natural light and panoramic view available for congresses and conventions. At guest disposal are also different boutiques, helicopters landing area, private dinners and events and a multilingual concierge service able to suit all your requests. City tax – € 3,50 per person/overnight (excluding children under 12 years), to be paid on spot at the check-out. Modern double rooms with king-size bed, all with balcony and sea view, The design, called also "The Art of Simple Luxury", has colorful fabrics and bold prints that recalls the character of Sicily, polished concrete floors, lamps of Italian manufacture and objects in clay created by famous local artisans. The spacious bathroom of approx. 9-11 sq.m., is finished in stone and equipped with a separated shower. Modern double rooms with king-size bed. They are located in the area of the panoramic villas close to the sea, all with sea view and private outdoor terrace on the ground floor. The design, called also "The Art of Simple Luxury", has colorful fabrics and bold prints that recalls the character of Sicily, polished concrete floors, lamps of Italian manufacture and objects in clay created by famous local artisans. The spacious bathroom of approx. 12 sq.m., is finished in stone and is equipped with a separate shower. 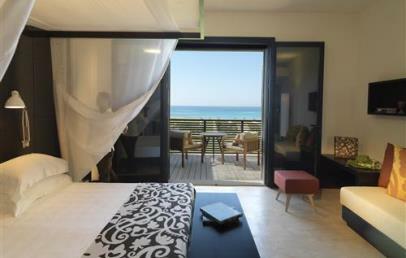 Modern double rooms with king-size bed, located on the first floor and all with balcony with sea view. The design, called also "The Art of Simple Luxury", has colorful fabrics and bold prints that recalls the character of Sicily, polished concrete floors, lamps of Italian manufacture and objects in clay created by famous local artisans. The spacious bathroom of approx. 10-13 sq.m., is finished in stone and is equipped with a separate shower. The Classic Suite are modern double rooms with king-size bed. 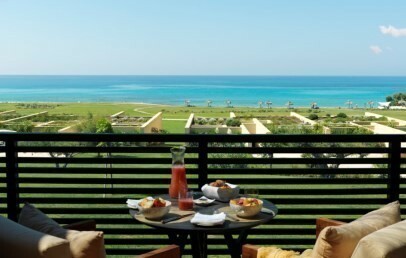 They are located in the area of the panoramic villas close to the sea, all with sea view and private outdoor terrace. The design, called also "The Art of Simple Luxury", has colorful fabrics and bold prints that recalls the character of Sicily, polished concrete floors, lamps of Italian manufacture and objects in clay created by famous local artisans. A spacious bathroom of approx. 13 sq.m., is finished in stone and is equipped with a separate shower. The Grand Suite has a spacious separate living room, a kitchenette, a large bedroom with a king-size bed and a walk-in closet. The suite is located in the area of the panoramic villas close to the sea and has an equipped internal courtyard, a double private terrace with sea view and a relax zone with a hammock. The luxury contemporary design recalls the simplicity of the culture of Sicily with colorful fabrics with bold prints, polished concrete floors, lamps of Italian manufacture and objects in clay created by famous local artisans. The spacious bathroom, finished in stone, has a separate shower and a relax zone. The Superior Deluxe Seafront are located on the ground floor and offer a stunning sea view. They have a generous living and working area with direct access to the private terrace and garden, equipped for alfresco dining and for relaxing moments with sun loungers. There is a king-size bed, a walk-in wardrobe and an en-suite bathroom with a tub and a rainfall shower. Long Stay - 20% reduction for minimun stays of 3 nights (valid for stays between March 1st and 28th and between November 10th and 24th)! Long Stay - 20% reduction for minimun stays of 2 nights (valid for stays between March 29th and April 17th and between November 1st and 9th)! Long Stay - 10% reduction for minimun stays of 3 nights (valid for stays between June 28th and July 14th and between August 26th and September 15th)! Long Stay - 10% reduction for minimun stays of 7 nights (valid for stays between August 5th and 18th)! Long Stay - 10% reduction for minimun stays of 3 nights (valid for stays between July 15th and August 4th and from August 19th to 25th)! Long Stay - 20% reduction for minimun stays of 3 nights (valid for stays between April 23rd and June 27th and between September 16th and October 31st)!